We are extremely fortunate to be staying in a Heritage listed park, Lakeside, where the Office is the original stable, and has the original timbers, which were once used as ballast in a ship, which brought over other building materials from England. The floor is unique and is called a “Pug & Post” floor and has local hardwood timber, which apparently go down 1 metre into the ground. The floor was purposely built unevenly to encourage the horses to move around, preventing poor circulation. The owners say that this theory doesn’t work for humans! The manor is not owned by the owners of the park, but was built between 1882 and 1885 by Englishman George Danby, youngest son of the Reverend Sir Robert Affleck, Baronet of Dulham Hall Suffolk England. George (Danby) Affleck took the name Danby in order to inherit the family estate, and had dissipated two fortunes before building Lakeside. Yesterday, in search of the Little Dip orchid, we had lunch at Freshwater Lake, but millions of weeds spoiled our search. We were lucky enough to find a half a dozen Onion orchids, but the flowers are so tiny that they are difficult to photograph. They are green and have flowers up the stem, which is quite unusual. We moved back to Old Man Lake (where we got stuck with the van the day before) and, without the horrific wind, it was like being in another part of the world. But still no orchids. It was a perfect, idyllic spot and we wished we had lunched there. Today we bought crumbed garfish and a potato cakes from the best fish and chip shop in the world! !, but had to sit in the car to eat them. The ocean view was magnificent, but even the sea gulls had a problem with the wind. Off up a sandy track to Stony Rise, stopping along the way, where the Rangers had placed large limestone boulders (to protect the orchids from vehicles) and we found two that were on their last legs. We are too late for them, now that the weather is warming up. 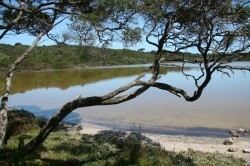 Drove along another sandy track into The Gums Picnic and Camping area, again loads of weeds and no orchids. There should be a lot of work done in the park for it to remain a ‘conservation’ park. It doesn’t appear that many people use the area. Tomorrow we are off to South End and Canunda National Park and we may not have reception.